The awarding ceremony of The 2007 Hong Kong Film Awards was held at the Hong Kong Cultural Centre yesterday. 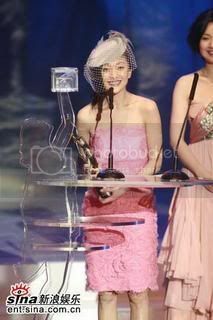 Lao Zhou won The Best Supporting Actress (Congaratulation!). When receiving the award she said:"Today, standing here, I am very glad for receiving the award. I'd like to thank the movie The Banquet, and the director Xiao Gang, Fung. This afternoon, I tried to think what I should say if I won the best supporting actress. Actually, when we play in a movie, many people work as supporting roles, such as actors and actresses in supporting roles, secondary directors, secondary art directors, assistants of costume, assistants of stage lighting, assistants of photograph, stage photo directors, masses actors or actresses, substitute roles and also the people who server us tea or water. Well, you see all these people play an important role in helping us advance in the process of acting films. So, it is very happy for me to won this award, thank you"